National Novel Writing Month is over, and I’ve won for the third year in a row. That is such a fantastic feeling! Even if you’re not a writer, I highly recommend doing NaNoWriMo at least once. Being given a deadline might be the thing that makes you actually do it. And if you are a writer, I can’t think of a better exercise. I learn so much every year, and this year was the best yet. I learned about focus, only reading or watching things that had to do with my story, mostly research about all the different risks to human civilization since this year’s novel was apocalyptic (of course). And therefore I learned a lot about climate change, hurricanes (especially Katrina), epidemics, and what will happen to the earth when all or most of the humans are dead. I’ll review some of the documentaries and books I’ve been going through, it’s fascinating stuff. Anyway, by keeping my head in the story, something was germinating all the time, and I never ran out of ideas. 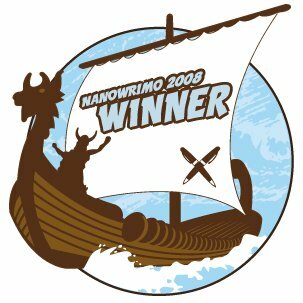 NaNoWriMo is upon us again, and I’m getting ready to embark for the third time on an insane mission: to write a 50,000-word first draft of a novel, from scratch, between November 1st and the 30th. In case you don’t know, this is an unofficial, international, and highly successful event started by Chris Baty and some friends about ten years ago, now including over a hundred thousand participants all over the world. The philosophy is two-fold. One part caters to the many people who’ve always wanted to write a novel, but are not in the habit of writing regularly and/or need some motivation and support to get that first draft done. It’s quite an accomplishment in itself to make it through the thirty days of November and cross that 50,000 word finish line.